Today’s report on gross domestic product (GDP) growth in the first quarter of 2009 just confirms the obvious: the United States economy is mired in a particularly steep recession. The chart below shows the decline in GDP and its components compared to the average of all other recessions since World War II. On every indicator except government purchases the current recession is worse than average, and it should be noted that further declines are almost inevitable in coming quarters. The last quarter of 2008 and the first quarter of 2009 together posted the worst half-year of GDP performance in over 60 years. While coming quarters may see a moderation in the pace of decline, it’s clear that this recession is already a stand-out in its severity and will only get worse. 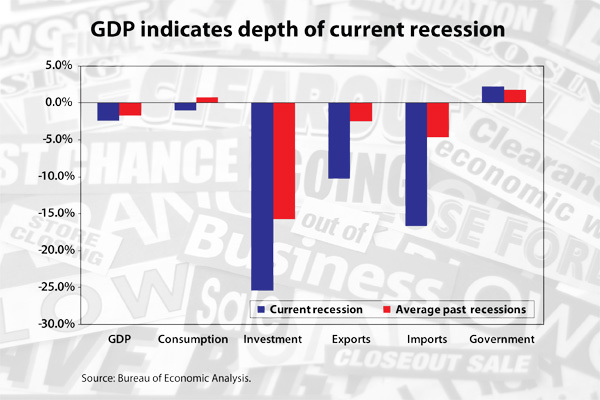 For more analysis, see today’s GDP Picture. Previous Previous post: Is Factory Pig Farming To Blame For Swine Flu? Next Next post: NAFTA Flu?